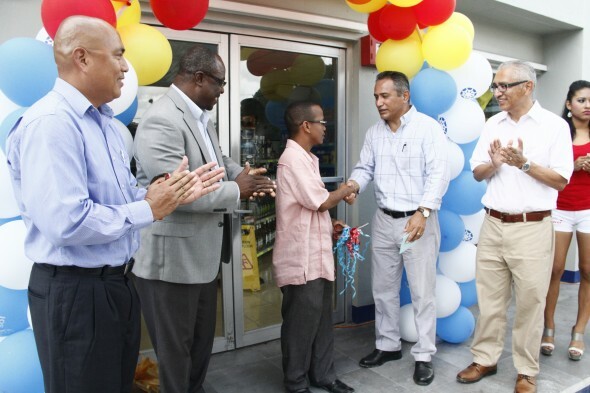 The eagerly anticipated re-opening of the tastefully renovated Shell One Stop Service Station in Orange Walk Town took place on Thursday October 24, 2013 at 10:00 AM on location at Belize-Corozal Road. It was enjoyed by customers who joined in the festivities, and took advantage of special giveaways to mark the occasion, including vouchers for free fuel which were given to selected winners throughout the day. The popular service station which provides vital services to customers of Orange Walk Town has undergone extensive renovations to its convenience store, which now features an upgraded forecourt, canopy and dispensers. The Orange Walk service station continues to offer quality Shell Fuels and Lubricants supported by an experienced team of energetic, friendly and customer-oriented staff. The convenience store is stocked with fresh food, snacks, drinks, vehicle products, ice, souvenirs and lots of other local offerings, while the Belize Bank Ltd. continues to provide its convenient ATM service at the station. SOL BELIZE LIMITED and Shell One Stop Orange Walk thanks all customers for choosing Shell and commits to continue serving the Orange Walk Town area with its quality products and services.